My good friend and Deputy Sheriff in Moore, OK, Mark Hamm, stopped by the hospital today to bring Trey something very special. He worked with the Cleveland County Deputy Sheriff to make Trey an official Honorary Deputy Sheriff. 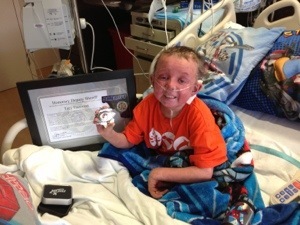 He gave Trey a certificate as well as HIS OWN REAL BADGE!!! Trey was so excited! Mark told me to tell Trey that when he gets better, he will get to go on patrol with him. Trey was super excited about that. So, I took a picture and made a video for Mark from Trey and Trey said a funny thing at the end of the video. He thinks he’s hilarious! Any way, a HUGE thank you to Mark Hamm for making this happen. Also, a HUGE thank you to Frank and Kathy Gaynor for coming to get Caleb from the hospital today. They drove all the way up just to pick him up and drive him back to Oklahoma. We couldn’t endure this journey without such good friends! Trey has had a good day…a little sleepy, but good. He is off the high powered oxygen machine and his lungs are doing great. He’s playing video games with his oldest sister right now and smiling…which makes me very happy. This will be a hard week for our family though. Please pray we have no surprises with Trey while we try and sort through everything for Emily’s mom’s funeral this week. Trey is having a hard time with Emily and I both having to be gone for the funeral this week…so please pray he will be okay without us for a night or two. He’s very emotionally unstable these days…so we are praying the Lord will guard his heart and mind. He will be done with chemo on Tuesday this week…and we are praying desperately this chemo will get his cancer in remission so he can get to the next transplant. Keep praying!!! Oh God hear and heal!!! Please know that I am praying for Trey and each one of you. I know you were very diligent to pray for Linda and me. Prayers lifted and sustained us for the many years and long, hard road of many chemo treatments. How wonderful God is that he loves us so much and provides such hope and comfort in our times of need! I found such comfort in Emily’s comment about experiencing a miracle on earth or being with Jesus in Heaven because I know that Linda is in Heaven in God’s loving arms. Please let me know if I can provide any help – I am available any time.